Tumkur :A first for the state and India – a floating solar power station. 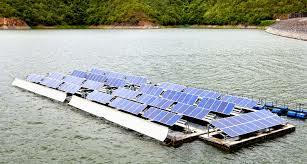 The Karnataka government has called for proposals to set up a 2 Megawatt (MW) capacity floating solar plant. The Karnataka Renewable Energy Development (KREDL), under the energy department, intends to set up the plant at Nittur Lake in Gubbi taluk of Tumkur district, a two-hour drive (98 km) from Bangalore. According to the power minister D K Shivakumar, the floating solar project is one the many ambitious projects of the state government, especially after the revised Solar Policy announced recently. Chief minister Siddaramaiah had announced the same in his budget of 2014-15. It is learnt that this is a pilot project. If it turns out to be a success, similar plants will be set up across the state. The local population will be the beneficiaries of this pilot project. Currently, the Hemavathi river water draining the lake is utilized for both drinking and irrigation purposes and reportedly only small portion of the lake will be utilized. Sources in the energy department revealed that the project would involve designing, engineering, supplying, fabricating, installing, testing and commissioning of the project in five years. “The total area of the said lake is 423.10 hectares (1,045.5 acres), not all of which will be utilised for generating solar power. As production would be just 2 MW, only a small portion of the lake will be used. As per the bid condition, the developer must generate not less than 14,00,000 units per annum. The project would feature photovoltaic-mounted panels as per the latest international standards on a floating platform with anchoring facility,” explained an official. Currently, the Hemavathi river water draining the lake is utilised for both drinking and irrigation purposes. We had a word with you regard solar power plant i would request for a call back on 7338055259 ..